Peak Oil is here, my friends. What are YOU going to do about it? For yourself? For your family? For your community? The longer you take to decide, the worse it will be (for all three). One piece of advice: Trade in that Hummer. Now. The next two decades will be profound. We will see price increase in things involving energy and fuel. Imports will be more expensive over time. Even the price drops won't last long...the change we predicted in the 70's has begun. I've been on the lookout for the signs that The Peak is here.... the earliest manifestations of Peak Oil are: (1) wars over who controls oil infrastructure, (2) prices of energy (primarily oil) steadily rising, (3) increasing spot shortages of energy and reports of inaccurate oil reserves; and (4) energy investment firms no longer finance energy projects if the fuel supply is not secured. There is plenty to do. I wish I had started a decade or two ago. To begin, you might go to Meetup.com and join a Peak Oil Awareness group in your community. Or start one. Get the DVD: The End of Suburbia. You can get your own copy via the Post Carbon Institute. I've taken these steps myself. Plus I am working to change my life to a less energy-intensive one. Your actions will depend a great deal upon where (and how) you live. My plan is outlined in my January blog: Peak Oil and Local Soul . Oh, and I just ordered a Pruis. If you want more information on this, feel free to contact me. There is plenty that can be done to prepare, but we need to start now. The next step is up to you. 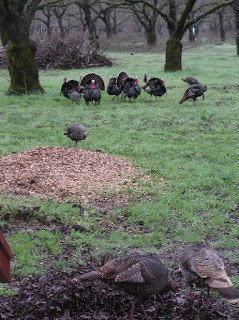 Each morning for the past week and a half, wild turkeys have graced the orchard. The males puff up and spead their tales in their spring ritual. Turkeys really do gobble gobble, by the way. Yesterday, I counted 72 turkeys. Even though they have shown up here every day this week, it seems so magical each time they appear. I hear them calling again at dusk, but see them only in the morning. Once the morning dew evaporates, the turkeys head for the hills.